Folks tell us we make the best barbecue they ever tasted. We think you all agree. We make our own marinade. We make our own rub. We make our own sauce. We smoke with hickory that we cut right here on our mountain. We slow smoke our pork shoulders for 16 hours, then pull them by hand. 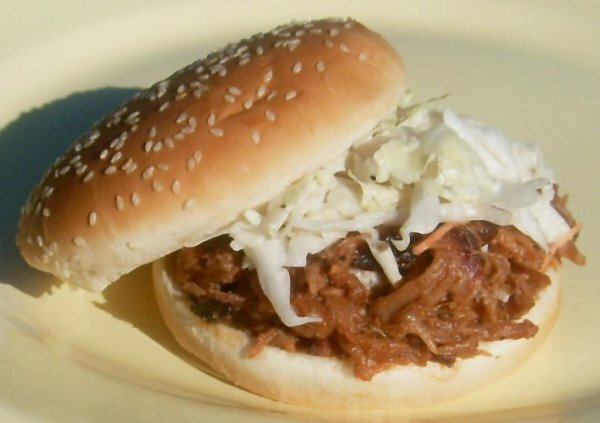 Our Pulled Pork Sandwich has a quarter pound of perfect barbecued pork on a big gourmet bun, topped with our famous hand made Blue Ridge Barbecue sauce and cole slaw made with our own secret recipe. ← Our favorite! Sugar snap peas!